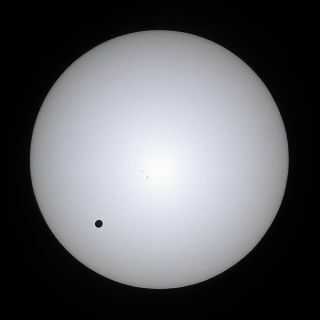 This rare event, known as a transit of Venus, will take place on June 5 for Western Hemisphere observers, though it will be June 6 local time for skywatchers in the Eastern Hemisphere. Over a seven-hour span, Earth's so-called sister planet will trek across the solar disk from our perspective, appearing in silhouette as a slow-moving tiny black dot, weather permitting. Venus transits occur in pairs that are eight years apart, but these dual events take place less than once per century. The last one happened in 2004, and the next won't come until 2117. Scientists are still interested in Venus transits today, though for different reasons. NASA's Solar Dynamics Observatory spacecraft, for example, will watch the June 5/6 event to help calibrate its instruments and to learn more about Venus' atmosphere, researchers said. And NASA's Hubble Space Telescope will observe the transit using the moon as a mirror, to test out a technique that could eventually probe the atmospheres of faraway alien planets. Make sure to see the June 5 passage of the planet Venus across the face of the sun: a similar event won't happen again until the year 2117.